The Greyboy Allstars: What Happened to Television? Flip through albums in the bargain Funk/Soul/R&B bin at your local record store and you'll find a mix of classic Meters, Mayfield, and James Brown LPs. 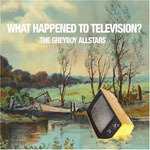 If a copy of the Greyboy Allstars' What Happened To Television? winds up in your stack, you probably wouldn't guess it was recorded in 2007. While many contemporary funk outfits have diluted their music with commercially driven slickness, the Greyboy Allstars have stuck to their roots. Their sound has not smoothed outit's the same platform shoe, Caddy for Daddy funk as on their previous albums, the last being A Town Called Earth (Greyboy, 1997). Are the Allstars pioneers? Certainly not. But stylistic innovation is not their goal. They are respectful of their timeless tradition and the truest funksters of their generation. Their music retains the gritty, old-school qualities of their predecessors' in both performance and production. No overdubbing was used on What Happened To Television? and they relied on tape-splice editing. Recording an album live inevitably leads to a few minor goofs, but these are reconciled by the group's spontaneous, collective vigor. Karl Denson is versatile on both saxophone and flute throughout, with his Maceo Parker-influenced blues licks and Coltrane-inspired harmonic dexterity. The rhythm section is arguably the most disciplined on the jam scene with an endless supply of tight, focused grooves. Drummer Zak Najor and bassist Chris Stillwell stay deep in the pocket. Keyboardist Robert Walter plays with a tastefulness that many organists lack and his solos are fluid and engaging. While guitarist Elgin Park's solo space is limited here, his comping is precise and energetic and a "how-to in funk guitar playing. "Deck Shoes is the fattest groove on this relentlessly funk-filled album. Denson's flute is hardly swallowed up by the heavy backbeatit is surprisingly beefy and forceful. An updated version of Nancy Wilson's "How Glad I Am features the angelic Living Sisters, fronted by the irresistibly charming Inara George. The Sisters' 1940s-styled delivery is ironic yet reverent, and it fits unexpectedly well above the Allstars' polyrhythmic groove. DJ Greyboy joins the fold on "Old School Cyclons, engaging Park in some interesting trading before the band rides out on Denson's deft flute. Switching to tenor, Denson examines each successive mode on "Knowledge Room in increasing depth. On "Pigeons Under Water, the group explores the psychedelic side of R&B, centered around Park's hypnotically droning guitar arpeggios and Walter's reverb heavy synth. What Happened To Television? showcases a mature and sophisticated Greyboy Allstars. The arrangements, melodies, and harmonic structures are more intricate, and ensemble cohesiveness plays a more central role than in the past. The solos are still stellar, but the group is less reliant on improvisation alone to generate an exciting listening experience. It's a testament not only to their maturity but to the music making processall the music was written and developed collectively while in the studio. What Happened To Television? is the Greyboy Allstars' strongest album to datehopefully listeners won't have to wait another decade to dig their next. Track Listing: V-neck Sweater; What Happened to TV? ; Still Waiting; Deck Shoes; How Glad I Am; Back In The Game; Left Coast Boogaloo; Old School Cylons; Knowledge Room; Pigeons Under Water; Give the Drummer Some More. Personnel: Robert Walter: keyboards; Elgin Park: guitar, vocals; Karl Denson: saxophone, flute, vocals, percussion; Chris Stillwell: bass, vocals; Zak Najor: drums, percussion, vocals; DJ Greyboy: turntables; Inara George: vocals; The Living Sisters: vocals. The Greyboy AllStars CD/LP/Track Review Greyboy Allstars Matt Leskovic Sci Fidelity Records / Knowledge Base United States What Happened to Television?